Lucy Gwynne Branham was born in Kempsville, Virginia, and raised in Baltimore, Maryland, the daughter of a suffrage activist and a physician. A student of history, Branham graduated from Washington College in Maryland and earned a master’s degree from Johns Hopkins University and a Ph.D. from Columbia University. While teaching in Florida, she received a Carnegie Hero Medal for saving a swimmer from drowning in the ocean. In 1918 Branham joined the huge push by the NWP to lobby for passage of a federal amendment in the Senate and focused her organizing efforts in Georgia, Alabama, and Tennessee. That same year, Branham played a prominent role in the Lafayette Park demonstrations. During one such protest, she held aloft a message from President Woodrow Wilson before “consigning” his “empty words” into a fire, declaring, “We want action, not words.” Branham was a participant in the “Prison Special” tour of 1919, during which NWP women who had been imprisoned traveled to cities around the country to talk of their experiences, often wearing prison garb when they spoke. After the ratification of the 19th Amendment, Branham headed the Inez Milholland Memorial Fund Committee, which created an ongoing endowment fund for the NWP. 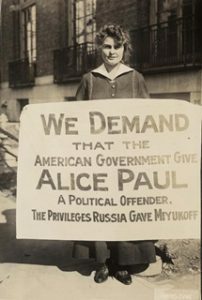 She taught briefly at Columbia University, worked with the American Friends Service Committee, and became executive secretary of the American Society for Cultural Relations with Russia (1926-30). Fluent in French, Russian, and German, she worked with the World Woman’s Party in Geneva and lobbied the League of Nations on equal rights issues. In the late 1950s she and her elderly mother lived at Sewall-Belmont House while Branham served on the NWP’s Congressional Committee to lobby for the Equal Rights Amendment. After her mother’s death, Branham suffered a nervous breakdown and was hospitalized for several years near her home in Delaware. Alice Paul, Mabel Vernon, and Edith Goode visited her there shortly before her death in July 1966.